Khabib Nurmagomedov settles his business after submitting Conor McGregor in the main headliner at UFC 229 on (Sat., October 6, 2018) UFC 229 from the T-Mobile Arena in Las Vegas, Nevada. As expected, Khabib used his superior wrestling to ground and pound Conor McGregor early. He suffocated the Irishman in the first and second frame. McGregor tried to fight back with his stand-up game in the third round. But Khabib in the fourth round showed why he’s the most dominant and best grappler in mixed martial arts. Eagle took his Conor’s back and locked on a tight neck crank to get the tap. But after finishing the fight and retaining the title riots ensues. Khabib began talking to Conor McGregor friends and jiu-jitsu coach Dillon Danis and the worst thing he jumped over the cage and started a brawl with Danis. 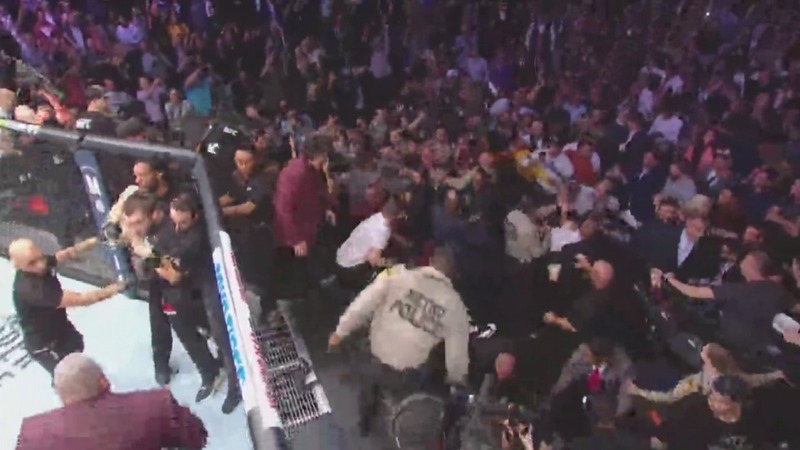 Not only that, Khabib’s teammates jumped in the Octagon and hit McGregor when he got up from being stunned. Previous articleKhabib Nurmagomedov Wins Conor McGregor Via Submission In The Fourth Round! Khabib dominates McGregor. Loses to Danis.